Next: What Happens to My Changes When I Upgrade? 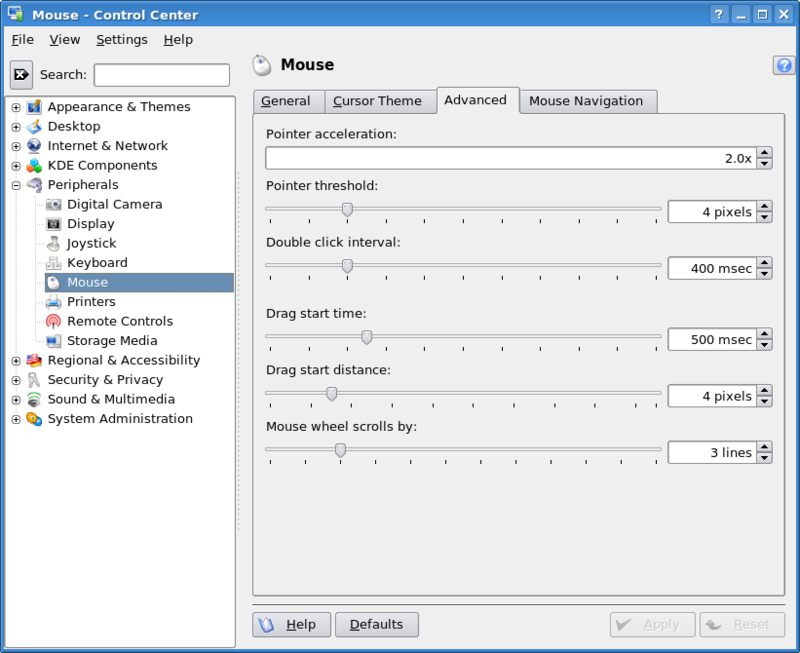 The Mouse page of the Control Center allows you to customize how your mouse works. There are four tabs on this page.. The general tab is about the basics. You can choose whether your mouse is right- or left-handed, reversing the scroll direction of the mouse wheel, and whether to use single- or double-click to open files and folders. 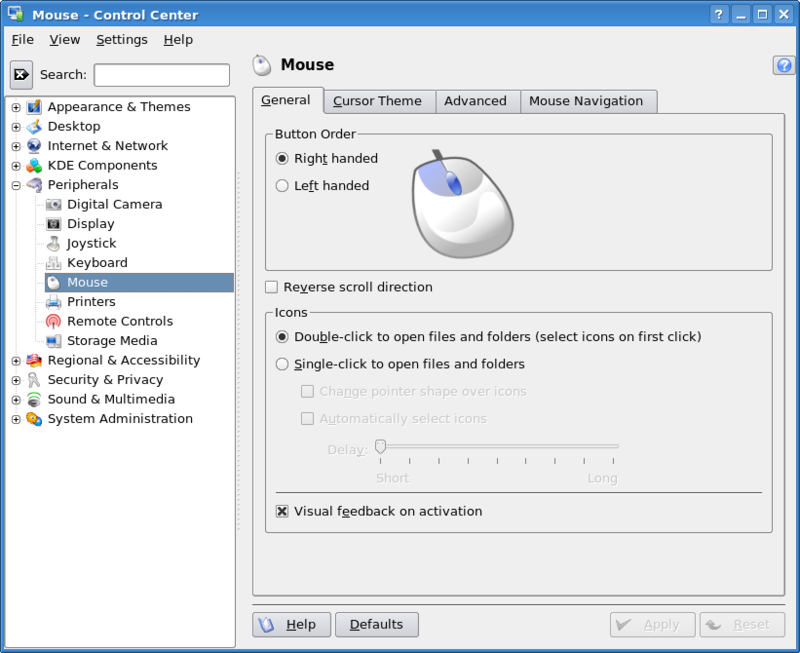 The General tab of the Mouse control page. The default for the Icons section is Single-click which means that a single click will always open an icon. This can be annoying if you want to select several icons before performing a task such as moving files or folders to another location. I always change this to Double-click click so I can single click the first icon and then hold the Ctrl key while I click on other icons to select multiples. The mouse cursor is the pointer that moves when you move the mouse. The Cursor Theme tab allows you to install and select different cursor themes for your mouse. Simply click on one of the displayed themes and then click on the Apply button to cause the new cursor theme to take effect. Select a different cursor theme from this tab. You can also download new mouse themes for KDE from the KDE-Look.org website. You can then choose X-11 Mouse Themes from the choices at the left of the page. Choose the ones you like and download them to your computer. These are all compressed zip files. Create the directory ~/.icons/default if it does not already exist. In case you do not already know, the Tilde (~) symbol always represents your home directory and is an easy way to refer to it in documents and when typing paths at the command line. Then change the present working directory (pwd) to ~/.icons/default and unzip the cursor theme file into that directory. This new cursor theme will only be available to you. If you want it to be available to all users on the system, your system administrator must install the theme in the /usr/share/icons directory instead of in your own .icons directory. You do not have access to this directory but your administrator (root) does. Now that the new theme is installed, you can select it using the Cursor Theme tab in the Control Center. You may need to restart KDE in order to see the new theme in the Control Center; you can accomplish that by simply doing a logout and then a login. The Advanced tab of the Mouse page provides you the ability to customize the ballistics of the mouse pointer. That is the response of the cursor to the movements of the mouse. The default setup is fine for most users but you may wish to experiment with these, especially if you have a very high resolution screen or a trackball, in order to provide better cursor response with those devices. The Advanced tab allows you to customize the mouse pointer ballistics. 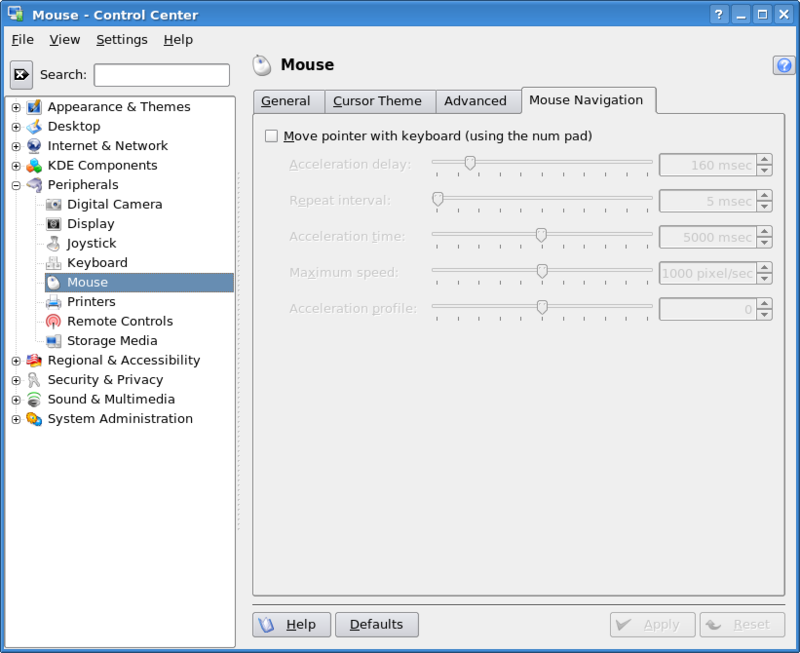 This tab provides the capability to define how the keyboard is to be used for mouse navigation. Unless you plan to use your keyboard to move the mouse you do not need to use this tab. This tab allows you to select how to use the keboard to move and manipulate the mouse cursor.